In the early days of 1937, the Ohio River, swollen by heavy winter rains, began rising. And rising. And rising. By the time the waters crested, the Ohio and Mississippi had climbed to record heights. Nearly four hundred people had died, while a million more had run from their homes. The deluge caused more than half a billion dollars of damage at a time when the Great Depression still battered the nation. Timed to coincide with the flood’s seventy-fifth anniversary, The Thousand-Year Flood is the first comprehensive history of one of the most destructive disasters in American history. David Welky first shows how decades of settlement put Ohio valley farms and towns at risk and how politicians and planners repeatedly ignored the dangers. Then he tells the gripping story of the river’s inexorable rise: residents fled to refugee camps and higher ground, towns imposed martial law, prisoners rioted, Red Cross nurses endured terrifying conditions, and FDR dispatched thousands of relief workers. In a landscape fraught with dangers—from unmoored gas tanks that became floating bombs to powerful currents of filthy floodwaters that swept away whole towns—people hastily raised sandbag barricades, piled into overloaded rowboats, and marveled at water that stretched as far as the eye could see. In the flood’s aftermath, Welky explains, New Deal reformers, utopian dreamers, and hard-pressed locals restructured not only the flood-stricken valleys, but also the nation’s relationship with its waterways, changes that continue to affect life along the rivers to this day. A striking narrative of danger and adventure—and the mix of heroism and generosity, greed and pettiness that always accompany disaster—The Thousand-Year Flood breathes new life into a fascinating yet little-remembered American story. 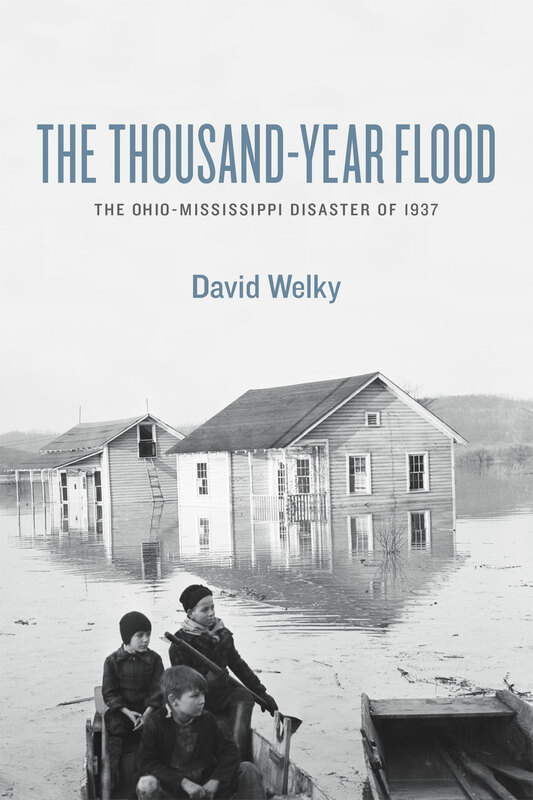 "David Welky has done a prodigious job of reminding us about the horror inflicted by the Ohio-Mississippi flood of 1937. At its heart, The Thousand-Year Flood is a Great Depression story not unlike the Dust Bowl tragedy. His scholarship is impeccable. Highly recommended!" "A wonderfully written, engaging narrative about one of America’s greatest and often forgotten disasters. David Welky captures the people, places, and mood with apt turns of phrase, telling details, and careful attention to atmospherics." "A well-written and deeply imaginative account of the history of the Ohio valley and the eventful 1937 flood. The book gracefully intercuts a clear narrative of national politics and flood-control policy with engaging and evocative portraits of the Ohio valley’s communities and its people--before, during, and after the deluge. It is always interesting, and often riveting." "A model of the disaster genre. . . . A comprehensive account, including political maneuvers over flood-control bills provoked by the deluge, this well-wrought history reflects thorough research and on-the-ground acquaintance with the Ohio River region."